University District Food Bank operates a walk-in food bank four-days a week to individuals and families from across Northeast Seattle. 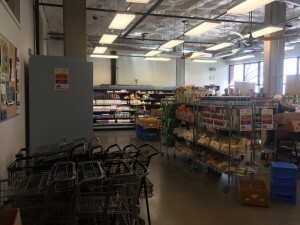 We offer food and toiletries, baby formula and diapers, pet food, and connections to important community resources to residents of zip codes 98102, 98103, 98105, 98112, 98115, and 98125. Customers may visit once per week during any of our open hours. Additional food support when the food bank is closed or for persons from outside of our service area can be found through the Community Information Line (just dial 2-1-1) and the Crisis Clinic website. We serve Northeast Seattle residents from zip codes 98102, 98103, 98105, 98112, 98115, or 98125 and those who are currently unsheltered in our community. When visiting, please bring a photo I.D. with you each time. On your first visit with us, please also bring a current proof of address (mail received at the address within the past 30 days, rent receipt, utility bill, cable bill, etc). Proof of address requirement waived for those who are currently unsheltered. Come to the food bank when it is convenient for you. We don’t run out of food during the week, so it isn’t necessary to arrive before we open for the day or earlier in the week. We are always closed on the following holidays – New Year’s Day, Memorial Day, Independence Day, Labor Day, Thanksgiving Day plus the Friday afterward, and Christmas Day. We may be closed a few other days each year as well depending upon the calendar. These closures will be announced on our home page. We are open on MLK Day and Presidents’ Day. You may receive groceries only once per week. Please bring your own shopping bags. It helps us save money and reduces plastic waste. Our carts are for use in the food bank only. Sorry, they have a habit of not returning when taken out the front door. Please shop within your weekly budget amounts, but leave all unwanted food items in the food bank. Others may want what you don’t. Help us respect our neighborhood. Please don’t litter, use our trash can out front. If it is full, let a volunteer know so we can empty it. Please don’t park in our neighbors’ parking spaces. We know parking in our community is sometimes challenging, but there are spaces on many of the nearby streets.